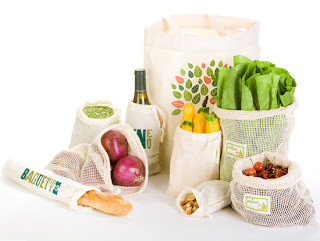 RETIRE IN STYLE BLOG: Living in Small Spaces..reusable bags! Living in Small Spaces..reusable bags! I just returned from the grocery store... with four plastic bags plus the bags for my produce. Sigh! Doing this sort of thing just drives me nuts! I do own and frequently use bags from Trader Joe's or Whole Foods. I open them in my cart and load my groceries and produce directly into them (no plastic bags for even the produce). Hopefully the day will come when reaching for the reusable grocery bags will become a habit. Living in a small space requires that we don't collect 1000 plastic and paper bags to be returned for recycling at the grocery store. We just don't have space for anything that cannot be put in a logical place and reused. We keep the grocery bags in the trunk of the car here in Tucson. I love the string bags for onions, apples and potatoes but I still don't own any of them. I have also seen bags for your baguettes, bulk items and muslin mesh bags for items that need air around them. In an article listing 10 healthy items we should have in our kitchens, Style at Home recommended the bags found on the Credo website. I have been looking at the ones found at Eco Bags for quite a while now...maybe I will take the leap and order the Fiesta Organic singles. Think they are so cool and I love the colors. If you see me at the grocery with a big red chain around my neck, you will know it is to remind me about those bags in the trunk of the car!